A property owner, such as a Hotel or Resort, has the duty to keep and maintain its premises in a reasonably safe condition to provide for its guests’ safety and prevent any potential incidents. When dangerous conditions are known by the property owner or its employees, the owner must warn its guests of the hazardous condition so as to prevent any risk of injury. The property owner must also remedy, and repair the dangerous condition as soon as possible. When a property owner creates or fails to remedy a dangerous condition, and a guest is injured as a result of the owner’s failure to warn, it can be held responsible for the injuries sustained. Aljuwon Pipkin, a 14-year-old boy, was a guest at a Hotel Resort in Orlando, Osceola County, with his family. One late afternoon, while playing with his brother in the jacuzzi/spa located on the Hotel’s property, one of the suction grates broke and Aljuwon’s body was pulled under water by the force of the suction drain. Aljuwon’s brother, who was also playing in the jacuzzi, tried to pull his brother, but Aljuwon’s body wouldn’t move. He began yelling for help. Aljuwon’s mother heard her son screaming, as did Aljuwon’s stepfather. They were only seconds from the spa and they both leaped into the water and tried to pull Aljuwon free, to no avail. The mother began screaming as she felt her son jerking in her arms, then her son’s body going limp. For long minutes, guests and hotel employees attempted to pull Aljuwon free, but the force of the suction was too strong. Others were looking for the jacuzzi’s emergency shut-off switch, but none existed. A guest who witnessed the entire incident asked hotel employees to shut off the suction drain, but they did not know where the switch was. It turned out that the one person in charge of maintaining the spa was already gone for the day and nobody on the premises knew how to operate and turn off the jacuzzi. At that point, the 14-year-old had been under water for more than ten minutes. That is when a fellow guest began ripping cables connected to the spa, which ultimately caused the suction to stop and allowed Aljuwon’s body to be freed. Paramedics worked on Aljuwon’s body immediately, administering emergency care and cardiopulmonary resuscitation (CPR) to the unresponsive minor child. After several minutes of incessant efforts, Aljuwon was miraculously brought back to life. 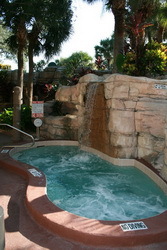 Personal Injury Lawyers at Leesfield Scolaro sued the Hotel for its negligence in failing to maintain and/or replace the defective grate of the jacuzzi spa which broke when Aljuwon was using the spa. Ira Leesfield alleged that the Resort was responsible for not having installed an emergency shut-off switch which would have allowed Aljuwon to be freed within seconds, not ten minutes too late. Personal Injury Lawyer Carol Finklehoffe alleged that the hotel was also responsible for negligent training of the hotel’s employees who simply did not know how to shut off the jacuzzi’s drainage system. As a result of the Hotel’s negligence, Aljuwon sustained brain damage requiring life-long medical care. On August 25th, 2011, the Orlando Personal Injury Attorneys at Leesfield Scolaro, Ira Leesfield and Carol Finklehoffe, on behalf of Aljuwon Pipkin and his mother, who witnessed the near drowning incident, settled this brain damage claim for a confidential amount with the Hotel Resort Defendant. It is the largest result in a pool entrapment case in Osceola County. Leesfield Scolaro have been handling Orlando personal injury lawsuits for individuals and families for over 35 years, serving those areas in and around Orlando (Orange County) and Kissimmee (Osceola County). If you or a person you know have sustained an injury as a result of a pool entrapment incident, contact one of our experienced Florida personal injury attorneys at 800-836-6400 for a free case evaluation. Tagged: "Drowning Accident", "Hotel Jaccuzzi Accident", "Pool Entrapment" and "Spa Accident"